Below is a brief summary of our full terms and conditions of use which can be found here. This summary is just that, a summary, and should not serve as a substitute for a full review or our complete terms and conditions of use. We do our best to keep this summary consistent with our full terms and conditions of use, but, if there is a conflict between the summary and our full terms and conditions of use, then our full terms and conditions of use shall supersede anything contained in this summary to the extent of any conflict. All content on this website is the property of Bolt Depot, Inc.
Print or make copies of the content for personal use IF you keep the BoltDepot.com logo intact. 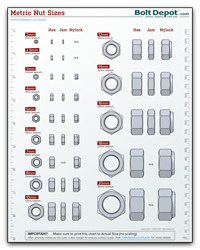 Print or make copies of the content for use in your business or organization to determine what fasteners you need, or whether Bolt Depot carries the fasteners you need IF you keep the BoltDepot.com logo intact. Use the content within the context of fair use. Remove the BoltDepot.com header from any print or copy of the content. Use the content to promote a business other than Bolt Depot. Use the content in any way that is likely to cause confusion to customers. Post the content to your website. You are responsible for keeping your username and password confidential. Anyone who uses your username and password will be treated as if they are you. If you believe your password may be compromised please contact us by phone immediately so we can reset it and check your account. Bolt Depot attempts to be as accurate as possible. However, we occasionally make mistakes. If a product description is not accurate, you can return for a full refund. Please contact customer service to arrange for the return. See details in our full terms and conditions of use.